I was raised on 2D fighting games. My fondest memories include my brothers and me shoulder to shoulder, huddled in front of the TV, battling it out in great games like Street Fighter 2, Mortal Kombat, Samurai Showdown, Marvel vs. Capcom and Tekken Tag Tournament. I was pretty confident I’d seen all there was to see in fighting games…and then I played DiveKick. I’m embarrassed by how much stupid fun I had with this insane and simplistic fighter. The developers at Iron Galaxy Studios are accurately touting Divekick as the world’s first two-button fighting game. Let me say that one more time: this game uses only two buttons. The rule applies to everything down to the character and menu selections. It sounds like a gimmick and they are certainly the most simplistic controls ever attempted in a fighting game, but the amount of depth that these guys managed to squeeze out of those two buttons not only boggles my mind, but also makes me question the need for the rest of the dozen or so buttons scattered across my controller. [singlepic id=15293 w=320 h=240 float=left]Playing this on a PS3, you’ll only need the L1 and R1 buttons. L1 controls your dive (jump), and R1 activates your character’s kick (flying attack back to the ground). Pushing the kick button while stationary will make you jump back from your opponent. It’s a new experience fighting with only two buttons, and I applaud Iron Galaxy for sticking to their guns and actually pulling it off. They even went so far as to produce promotional arcade style “Hit Box” controllers that prominently display the game’s solitary two buttons, although there are no plans for mass production at this time. The controls are easy and inviting to both new and inexperienced players. Even my girlfriend (not big on fighting games) was rocking Divekick and beating me. But the more you play, the more you realize the simple controls are masking the inner workings of a serious fighter that requires strategy, timed precision, character advantages and skill. The fights are broken up into 20-second rounds. Every fight is a one-hit kill. If you kick your opponent first, you win the round, and five rounds earns you a victory. If your kick lands on their head, there’s a headshot bonus and your opponent starts the next round with a concussion that momentarily diminishes their jump and kick abilities. If the timer runs out, the fighter closest to the center of the screen is the winner of that round. Every kick charges up your fighter’s “Kick Factor” meter which, when full, can grant added abilities such as speed and kick angle boosts. There is an online ranking board, and already the battle for the top spots is fiercely competitive. It’s wildly fun to experience and, due of the simplicity of control, Divekick leaves no one to blame but yourself when you lose. Let me tell you, it can be extremely infuriating when you lose. I’m a generally calm guy, but for some reason losing a close round in this game really taps into my rage centers in ways I haven’t felt in years. I guarantee there will be broken controllers resulting from angry gamers playing this. It’s amazing how tense a fighting game using two buttons can get. [singlepic id=15295 w=320 h=240 float=left]The two button controls also make this perfect for parties. One of the problems I have with contemporary fighters is the need to memorize an advanced button sequence in order to remain competitive. Super move lists are great if you put the time in and it’s fun if you know what you’re doing, but it can be intimidating for new players. 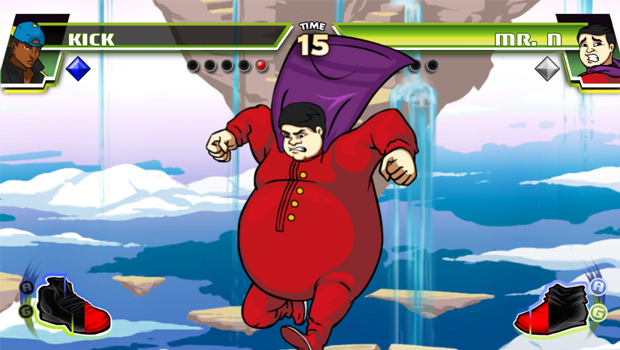 Divekick’s two button controls level the playing field, making it perfect for random casual players to join the fun. And while I would never promote inebriated gaming, I could easily see this becoming the dorm room’s replacement for beer pong. I know I wish I had this game in college. I was also happy to see that they added a full single-player story mode that delves into the history and motivation for each character as they enter the Divekick competition. Just like in the classic days of Street Fighter, each fighter has a personal rival and you won’t get the full story until you defeat the boss of the game. The scenarios the developers thought up are hilarious. It’s the kind of refreshing and random humor that you’d expect a small group of friends to joke about in a comfortable setting. I was hooked and I found myself needing to play through every character to see what crazy stories they would come up with next. [singlepic id=15296 w=320 h=240 float=right]Just like the control scheme, the art style is simple but fun. You aren’t going to find anime-quality renderings like those in the Guilty Gear series or the level of stage interaction experienced in Injustice: Gods Among Us, but you will find a humorous charm that is hard to deny. The look actually kind of reminds me of the animation style found in Adult Swim Cartoons such as Aqua Teen Hunger Force. It just looks ridiculous and insane, but I wouldn’t have it any other way. It’s easy to dismiss DiveKick as a joke taken too far. The initial Kickstarter project admits that it “is a game born from humor.” Divekick is a self-conscious parody of every fighting game convention since the early days of Street Fighter. And I must admit that I was at times embarrassed to be caught playing it because it just looks so insane (a pregnant skunk bear fighting a demon in a straight jacket?). But Divekick is much more than a throwaway joke. It’s executed so well and with such a meticulous level of detail that it is closer to an homage of the fighting genre than a simple parody. It’s obvious that this is a labor of love, and that the developers at Iron Galaxy put a lot of themselves into the game. Trust me, if you’re a fan of 2D fighters, you will absolutely love Divekick. This one’s made for you. Divekick is now available on PS3, PS VITA and Steam for $9.99 USD. Stefan started gaming the day his dad brought home a shiny, brand new commodore 64. He's been hooked ever since. Whether he's leveling up his ninja in Final Fantasy Tactics, cruising the streets of San Andreas or working on his Terran build order, videogames are never far from his mind. He is currently on the lookout for an appropriate 12 step program to address his electronic addiction.